Directory of Tesla Turbine technologies. Rather than using blades and friction, the Tesla Turbine uses parallel, closely spaced disks that tap viscosity. Aerodynamic skin adhesion effect resists fluid or gas flow between plates, resulting in energy transfer to the shaft. The technology has been proven to work but is yet to break into marketplace in a cost-effective version. PowerPedia:Tesla Turbine -- Bladeless Boundary Disc: Rather than using blades and friction, the Tesla Turbine uses parallel, closely spaced disks that tap viscosity. Aerodynamic skin adhesion effect resists fluid or gas flow between plates, resulting in energy transfer to the shaft. Viscotherm - of Hydrostatic Slip Drives and Decanter centrifuges. Plans on CD - all the information you'll need to build an industrial quality Tesla disk turbine using home shop tools. Air-powered Tesla Turbine - No longer available. Obilaser. Tesla Turbine, from Gyroscopes Online Out of stock because Obilaser doesn't make them any more. Global Energy Technologies, Inc. - Dr. Frank Germano replicated the Tesla Turbine and has had a turbine in continuous operation without component failure since October of 2000. An engineering report posted on his site says that the "Charlie" replication of his company is documented as achieving a 62.2% efficiency at 13,000 rpm, with 44.8 horse power output. Germano's new design incorporates several major changes, most notably, it is now a shaft-less design featuring a hollow center shaft functioning as the main exhaust.Note: See Directory:Tesla Turbines below. Centripetal Dynamics - The TurboFlux™ PGS consists of a series of flat disks mounted on a shaft and rotating within a casing. The steam [or gaseous products of combustion] enters with high velocity at the periphery of the disks, flowing between them before escaping through exhaust ports. Fluiditic properties of adhesion and viscosity literally pull the turbine rotor around. Sustainable Energy Developments - Developing grid independent power systems with Expanding Gas Turbines – a Bladeless, Bearingless, Ejector Style turbine with 50% to 80% greater efficiencies than traditional turbines. The ability to use low grade ‘wet’ steam and renewable power such as solar thermal, will enable it to produce power at a price comparative to the grid. Demo Model August, 2007. Commercialisation March 2008. Phoenix Navigation & Guidance Inc. - Ken Rieli Note: See Directory:Tesla Turbines below. Tesla Engine Builders Association (TEBA) - Note: See Directory:Tesla Turbines below. Build a 15,000 rpm Tesla Turbine using hard drive platters - To build a turbine like this, you need some dead hard drives, some stock material (aluminum, acrylic), a milling machine with a rotary table, and a lathe with a 4 jaw chuck. I run my turbine on compressed air (40 psi), and it easily reaches speeds of 10-15,000 rpm. While the speed is high, the torque is low, and it can be stopped with your bare hand. Gyroscopes Online - This affordable production tesla turbine has been designed for educational use and also to promote Tesla turbine technology. It runs from air pressure and generates electricity from a 3 phase AC motor/generator. It has a see through design that enables visual inspection and easy explanation of the technology and forces. Tesla BBS - Boundary-Layer Breakthrough: The Tesla Bladeless Turbine - From The Tesla BBS. Interesting plain-text explanation with long quotes from historical sources. A few technical errors, but still worthwhile. Open Source Tesla Turbine Developers Forum - The Phoenix Turbine Builders Club is a FREE resource, open to anyone who wants to build & experiment with the online Tesla turbine projects. Yahoo Tech Group - Emphasis on the Tesla Bladeless Boundary Disk Turbine and Pump. U.S.Patent 1,061,206 Tesla Turbine - New and useful Improvements in Rotary Engines and Turbines. '''U.S. Patent 1,329,559 Valvular Conduit - Tesla Gas Turbine. GB24001 (Oct. 17, 1910) - Improved method of imparting energy to or deriving energy from a fluid and apparatus for use therein - Bladeless turbine having disc rotors Openings in the central portions and separating star-washers Riveted into single, solid structure Keyed to the shaft Turbine or rotary engine. GB186082 (Sept. 25, 1922) Improvements in the Construction of Steam and Gas Turbines - Two heavier end-plate Tapered toward the periphery Reduces maximum centrifugal stress. GB186083 (Sept. 25, 1922) Economic Transformation of the Energy of Steam by Turbines - Improvements to increase efficiency of steam power plants and thermo-dynamic transformers Producing motive power Economical Operable at very high temperature Operable with cheap fuel Avoids deteriorating actions previously common System is related to the Tesla turbine. Disc Turbine Rotor Assembly Feb. 17, 2004 - Guy Louis Letourneau - Turbines comprised of spaced-apart rotor discs were first described by Nikola Tesla in U.S. Pat. No. 1,061,142 and 1,061,206. For this reason, these turbines are sometimes referred to as Tesla Turbines, but are alternatively known as Prandtl layer turbines, boundary layer turbines, cohesion-type turbines, and bladeless turbines. Building the Tesla Turbine - by Vincent R. Gingery. Review: "Travel back in time and experience the excitement of the era by building your very own model Tesla Turbine. Read along as Tesla describes in his own words the principles and incredible capabilities of his turbine. Examine the original Turbine patent descriptions and drawings for yourself and gain an even greater perspective of this amazing invention. Also included in this book are step by step instructions." Tesla's Engine: A New Dimension for Power - Jeff Hayes, from 21st Century Books Hayes is also involved with Tesla Engine Builder's Association above. The Tesla Bladeless Turbine and Related Turbomachinery - Gary Peterson. Description: "The Bladeless Turbine" by C.R. Possell and a compilation of Tesla's original "Fluid Propulsion" patent application, including amendments. Also included is the "Valvular Conduit" patent, and an abridged version of the 1931 article "Our Future Motive Power." Twenty-two mechanical drawings of Tesla engines and pumps, plus photos. vi, 24 pages, illustrated. Tesla Turbine References Expanded Edition - Compiled by Leland Anderson & Warren Rice. Description: A list of more than 240 citations spanning the period from 1911 to 1996. Most of the references before 1943 are to articles that appeared in period newspapers and magazines. The more recent references are mainly to M.S. thesis, Ph.D. dissertations, and papers that have been published in various engineering journals and conference proceedings. 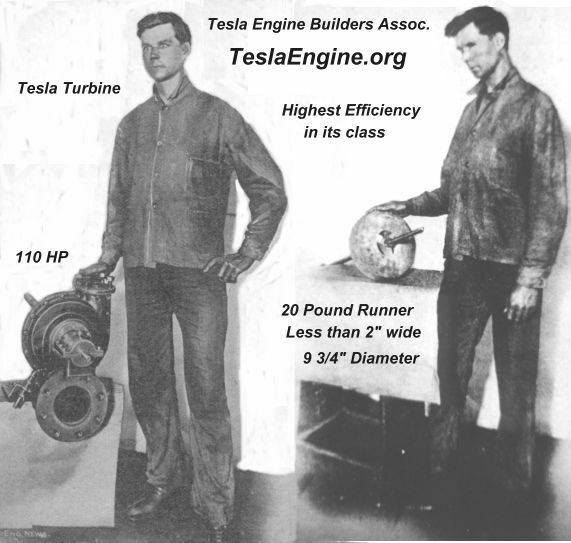 Debunking the Debunker' -- Part II Tesla Engine Builders Association (TEBA). Tesla's Bladeless Boundary Disk Turbine and Pump - Frank D. Germano, International Turbine And Power. The Tesla Boundary Layer Turbine- Alan Swithenbank, July 19, 2003. Boundary-layer breakthrough - the Tesla bladeless turbine - Jeffery A Hayes, from Zero Point Physics, Vacuum Energy, Scalar Physics, which says "All the major car companies are now working on levitating vehicles." Tesla turbine, from Uncle Taz Library.